Turvec have designed a number of bike shelter variants that are able to support both extensive and intensive green roofs and brown roof variants. 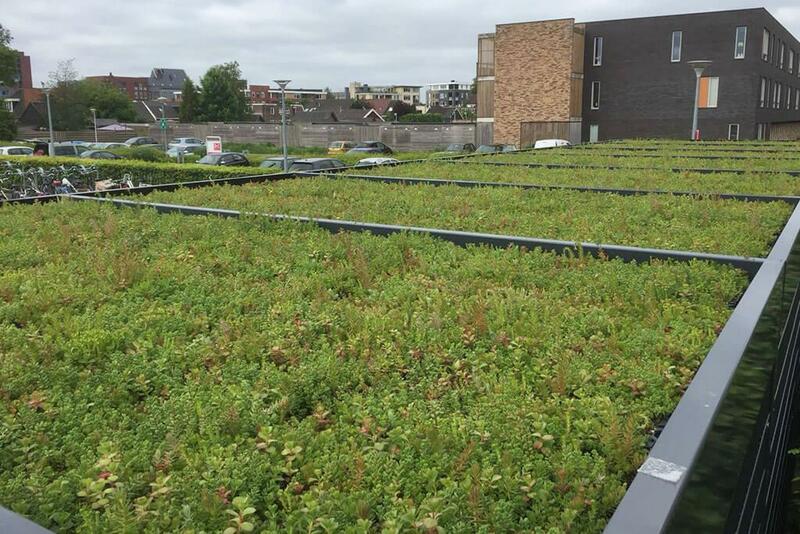 A living roof is a covered in plants that sit within a membrane system allowing for the storage of water, these roofs provide both aesthetic and environmental benefits and are particularly popular in urban environments. Our green roof bike shelters are designed to accommodate the additional weight created by these roofing systems and house the membrane systems that they require. We can accommodate a living roof onto most of our shelter designs such as the Cubic, CubicUp or bespoke solutions, contact our design team for further support. Shelter installation does not vary significantly with the addition of a living roof system. Dependant on the specification of roof on the project, a dedicated vehicle may be required to deliver sedum, or additional time will be required to lay the roofing substrate. When considering the specification of living roof for your bike shelter, maintenance should be considered, a number of roofing specifications require little to no maintenance. This is important when considering that the vegetation may be situated over a large roof span up to three meters above ground level, making access difficult.